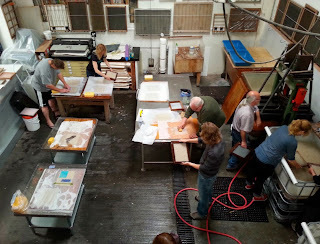 In April and May, Magnolia Editions will be hosting two new papermaking workshops in our renovated paper studio. Handmade paper can act as more than sheets - finely beaten paper pulp can function like paint! 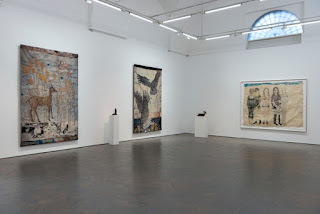 When dried, the pulp painted imagery is a part of the actual paper, which can stand alone as a work of art or be transformed further with printmaking, photography, collage, painting, becoming an extraordinary mixed media creation. This class will cover various pulp painting techniques, such as direct painting, stencils, and collage inclusions. Students are encouraged to bring items for inclusions, such as fabric, old photographs, thread, lace, or other items that will not bleed when wet. Instructor Michelle Wilson is a papermaker, printmaker, book and installation artist. Her work has been part of exhibitions at numerous institutions, including the X Initiative in New York, NY, the Chicago Center for Book and Paper Arts, the 2006 International Biennial for the Artist's Book in Alexandria, Egypt, and at the Joshibi Art Museum outside of Tokyo, Japan. Her extensive teaching experience includes San Francisco State University, Bryn Mawr College, Moore College of Art and Design, the University of the Arts, the San Jose ICA Print Center, and the Kala Art Institute. In addition, she has served as a hand papermaking consultant to Signa-Haiti, an NGO in the process of developing a sustainable and bio-dynamic economy in Haiti. This is a hands-on class to learn about creating custom shaped paper sculptures from wire, reed armatures and shaped forms. Students will learn the different preparation and building techniques for paper sculpture, and then try them to get a feel for which process they enjoy. The covering material will be over-beaten abaca, a thin translucent material which shrinks as it dries. Building materials will be provided, and thin over-beaten abaca will be prepared in advance. Students will have the opportunity to learn how to pull sheets, press and cover their sculptures. The sculptures will be small due to time constraints, but techniques for larger scale sculpture will be discussed. We will spend a small portion of the day discussing several current artists in the field and methods of process. Course level: beginning or intermediate. Instructor Rhiannon Alpers is a papermaker, letterpress printer and book artist. She holds a BA and an MFA in Book and Paper Arts. She has taught workshops and college courses nationally, and frequently teaches papermaking and bookbinding in the Bay Area. Her custom bookbinding and letterpress business Gazelle and Goat is located in San Francisco. Classes will be limited to 8 participants each, so early reservations are recommended. Your place will be considered reserved once we have received your payment. The fee for each workshop is $160 per person; materials will be provided at no additional cost. Each participant will also receive a free copy of Donald Farnsworth’s book A Guide To Japanese Papermaking (while supplies last). For more information or to arrange payment, please email papermagnolia@hotmail.com.